Comfortable apartment, with terrace - beautiful residence with swimming pools. 1 bedroom, ideal for 4 people - close to the beach and centre in La Pineda. 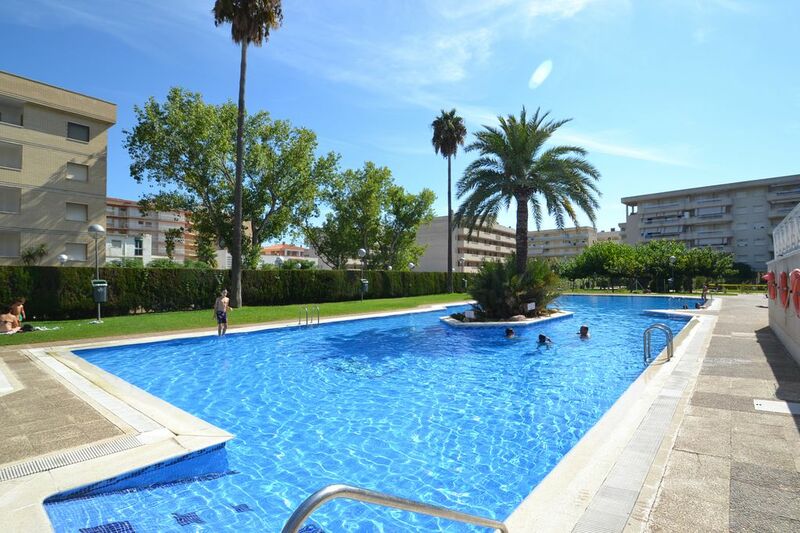 Pleasant apartment in a big family residence with large green zone and beautiful community swimming pools, ideally located close to the main beach and centre in La Pineda. This apartment, standing on the first floor of the residence (elevators), is bright and functional; it counts with a triple bedroom with one double bed and one single bed, a complete bathroom with bathtub, an equipped open-plan kitchen as well as a living room with sofa-bed, ceiling fan (+ mobile fan) and a picture window to get out to the big furnished terrace (table + chairs). From the terrace, there is a pretty view to the interior of the residence and its big green zone with lawn, trees, plants, and 2 beautiful swimming pools, outdoor showers, etc … . Comfortable, it has been equipped for a pleasant stay with an unlimited Wifi connection and the linen included. It stands in a pretty residence with a big community swimming pool with one pool for adults (islet with palm tree and plants) and one pool for children, outdoor showers, a vast green zone with a beautiful fountain and petanque track. Not far from there and if you wish to share with your family an unforgettable day, you'll find the Aquopolis water park, facing La Pineda's maritime promenade, as well as the famous Port Aventura and Ferrari Land theme parks in Salou, about 5 minutes from there. La Pineda is a family seaside resort standing about 100 kms. South from Barcelona, about 2 kms from Salou and 5 kms from Tarragona, known for its rich cultural patrimony, classified at the UNESCO and 2 kms North from Salou. It offers many activities such as the Aquopolis water park, a dolphin show, a modern Spa and fitness centre, bars, restaurants, nightclubs, shops. Only 5 minutes from there stands Salou and its famous Port Aventura and Ferrari Land theme parks, amongst the most important in Europe. World Vacances Plus is a booking centre between individuals, created in 1998 and installed here on the spot, in Salou. We are here to help you with finding a holiday rental which corresponds exactly to what you're looking for, depending on your enquiry criteria, expectations and needs, and follow you through all the steps of your booking, in English, until key collection; for this apartment, it will take place directly outside the residence with the landlady who, you'll see, is really charming. Being here on the spot, we personally know each of our properties and their owners and can therefore perfectly answer all your questions. Economic and comfortable apartment, with large furnished terrace. Linen and unlimited Wifi connection included. Residence with swimming pools and a garden with fountain, close to the beach, maritime promenade and centre of La Pineda's seaside resort. Close to the residence, you'll find all kinds of facilities and services such as regular bus lines (24-24) - it is not necessary to have a car. Apartment with one bedroom and a big terrace, ideal for a little family of 4 people and well located, in a quiet family residence, with swimming pools, green zones and elevators. Easy access, walking, to the beach and to all facilities available in the centre of La Pineda. The linen is provided to you for free. An unlimited Wifi connection is included. Living room with sofa-bed, ceiling fan and way out to the terrace. Large terrace with table, chairs and view to the swimming pool of the residence. Property with an interesting value for money and comfortable. Linen and unlimited Wifi connection included. Residence with swimming pools, green zone. Close to the beaches and centre of La Pineda - walking access. Hints and tips will all be sent to you by e-mail before your arrival. By car: Exit nº35 from the AP7 highway - Salou. By train: 5 kms from Salou's train station. By plane: 15 kms from Reus' airport and 95 kms from Barcelona's airport.